This might not be the simplest, quickest or even the most fussless dessert I’ve created but I can promise you that it is definitely worth every minute of the effort. 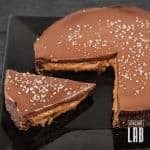 This low-carb chocolate salted caramel tart looks supercool, it tastes megadelicious and even I can eat it, along with my fellow calorie-conscious dedicated carb-avoiders. I have to admit that my enchantment is essentially the result of its looks. During a more serious diet one should not even risk looking at it, let alone approaching, or heaven forbid, tasting it… This would definitely seem to be unforgivable but in this case it isn’t even sinful. The most incredible part is the sugar-free and almost calorie-free caramel sauce. A few months ago I wouldn’t even have dared to dream about such a miracle, but now, here it is. I’ve made it. Okay, okay, it may not be entirely my invention, but I did manage to marry it with this wonder cake. Anyhow, this beautiful, extremely delicious, low-calorie and low-carb piece of art makes me feel really proud – and on the top of all that it was a smash-hit with my testers. 1. Measure the ingredients and pulp the avocado with a hand blender. The avocado will be used as a substitute for butter. Mix the dry ingredients in a medium bowl then add the avocado pulp and the egg. Finally scrape the vanilla seeds into the mixture and use a fork or your hands to work the dough until it is well combined. 2. Put it in the fridge for 10-15 minutes. 3. While the dough is sitting in the fridge, prepare the caramel. Put the erythritol into a saucepan add the honey and start heating it over medium heat. As Erythritol is in fact not sugar it would not caramelize without the honey. Don’t stop stirring it so that it doesn’t burn. 4. When the liquid has a brownish color remove it from heat and slowly pour the cream into the pan. Be careful, if you do it too quickly it will boil over. Boil it some more over low heat. 5. Blend the conjac flour with the water while stirring until the mixture is thick but still liquid. Add 20 ml of the hot syrup. Do not stop stirring to prevent lumps. Then slowly pour the liquid conjac flour mixture into the syrup while still stirring. If the syrup is smooth enough let it cool for 15 minutes. If there are still lumps in it, don’t worry just have a go at it with an electric blender. 6. Get the dough from the fridge and gently fit into bottom and up sides of a cake pan lined with parchment paper. Prick it with a fork then cut a cake-sized piece of parchment paper put some lentils on it to press down the cake while baking. This should prevent the cake from bulging and cracking. 7. Preheat the oven to 180 °C/350 °F and bake for 15 minutes. Remove the lentils and put the cake back into the oven for another 10-15 minutes. When it is done let it cool a bit. 8. 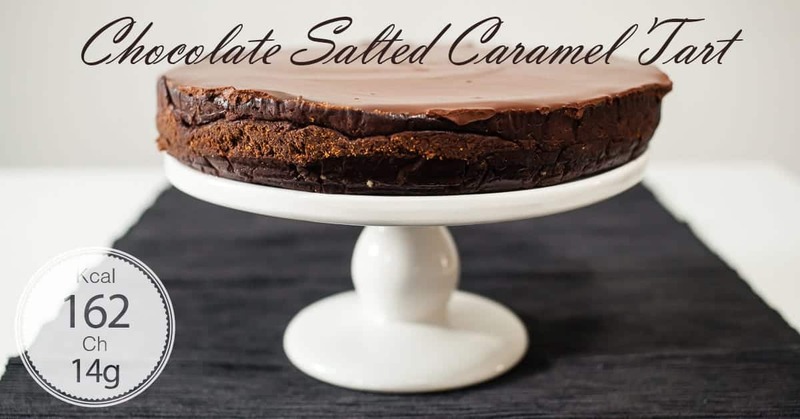 When it has cooled down pour the cool caramel syrup over it and put the cake into the fridge for a few hours or for the night to let the caramel harden enough to take the chocolate frosting the following day. 9. Heat the cream over medium heat then break the chocolate into small pieces and put it in the cream. Melt the chocolate while stirring and carefully pour it over the cake. 10. Put it back to the fridge to allow the chocolate coating to harden. The tart requires 8-9 hours (one night) chilling time. 2. Pulp the avocado with a hand blender. This will substitute butter. 3. Mix the dry ingredients in a bowl. 4. Add the avocado pulp. 5. Then add the egg too. 6. Use a fork or your hands to work it into a smooth dough. 7. Put the dough in the fridge for 10-15 minutes. 1. Prepare the caramel while the cake is in the fridge. Pour the erythritol into a saucepan. 2. Add the honey and heat it over medium heat to caramelize. Stir to prevent burning. 3. When the liquid turns brown remove from fire then add the cream. Do it slowly to prevent boiling over. 4. Boil it some more over low heat then remove from heat. 5. Stir the conjac flour while adding a little water. You should end up with a thick but still liquid mixture. Add approx. 20 ml hot syrup to the mixture. Stir continuously to prevent lumps. Finally add the liquid to the remainder of the hot syrup while still stirring. If the mixture is smooth enough let it cool for 15 minutes, if there are still lumps in it, use an electric mixer to blend it. 6. Line a cake pan with parchment paper and put the dough in it. Make sure to gently fit into bottom and up sides of pan. 7. To prevent the cake from bulging prick it with a fork. 8. Cut a cake-sized piece of parchment paper and put some lentils on it. This will press down the cake and prevent the cake from bulging and cracking. 9. Put the cake into the oven preheated to 180 °C/350 °F for 15 minutes. Remove the lentils and put the cake back for another quarter of an hour. 10. When done, let the cake cool. 11. Take the caramel and pour it on the cool cake. 12. Put the cake into the fridge for a few hours or for the night to let the caramel sauce harden. Next day you can apply the chocolate frosting. 1. Heat the cream over medium heat, break the chocolate into pieces and put it into the cream. 2. Melt the chocolate while stirring. 3. When you are done, pour it slowly on the cake. 4. Put it in the fridge until the chocolate frosting hardens. 5. Now the salted caramel chocolate tart is ready! Julian Bakery InstaKetones Review: Does It Work?